What is an Angle Body Valve? ● The valve’s piston can be pulled up and off the fluid’s path, ensuring it won’t obstruct the fluid’s flow. ● The lower bend of the valve seat ensures faster media flow through the valve. ● The minimal obstruction of the low valve seat makes angle body valves an ideal choice for thicker, heavier fluids and slurry that do not move as fast as light fluids. Angle body valves carry the same standard valve benefits as well as others that result from a set of proprietary features. The models in this range can handle fluids with temperatures of up to 356°F and flow pressure of as high as 232 psi. The valves are specially designed to control hot water, inert gases, steam, oils, as well as aggressive and corrosive fluids. ● Parker Angle Body Valves meet the terms of the 94/9/CE directive, which forbids use of electrical equipment within close proximity to potentially explosive media - zone 2/22. Angle valves have limitless applications in the food processing and beverage manufacturing industries. The valves for this application are marked by two basic considerations - whether the valve will control actual food (fully prepared or ingredients) or process utilities like water and steam. For processed food, the most common valve use will be in the canning or bottling sections where they are preferred for their precise and automated servings. This is perhaps, historically, the most common valve application, which was later adapted to other industries. Here, valves are used to mix in water treatment chemicals, regulate pipeline pressure, and to distribute water into individual sub lines. Municipal authorities can also use valves to shut off the water supply so important repairs can be carried out, or even to force defaulting customers to settle their arrears. Textile manufacturing plants use a lot of water and chemicals for cotton spinning, fabric treatment, dyeing, and drying, all of which depend on hot water and steam from large boilers. Without good valves, the larger fabric mills would struggle with all these functions, which are central to their operations. Combustion engines and heavy machinery that run mortars generate a lot of heat. All this heat will affect the proper functioning of the engines and ancillary equipment if the engine is not cooled regularly. For this, radiators and other cooling devices are installed. However these will require a valve to regulate the water supply, determining at what point the engine needs cooling. Similarly, injection molding systems need some form of cooling mechanism to cool and harden molten plastic after it’s been fed into the mold cavity. Without a valve, it will be a laborious process to manually turn on the water supply every time the molded objects need cooling. Pharmaceutical manufacturers use valves for a variety of purposes, including filling medicine bottles, mixing, as well as for sterilizing production line pipelines. But due to the critical need to ensure utmost product safety, valves for this industry must not have any dead space where remnants from one batch can collect and contaminate the next batch. This is why angle body valves, because of a clearer flow path, are a perfect fit for this industry. Due to the same need to ensure thorough sterilization to avoid bacterial contamination, it is a common requirement that valves for this application be lined with PTFE. PTFE provides an excellent shield against corrosion and bacterial contamination. The same benefits apply for the cosmetics industry, where the careless handling of chemicals can expose users of the products to dangers like allergic reactions, skin rashes, and cancers. Chemical processing plants have to handle sometimes corrosive and very dangerous chemicals. As such, the pressure at which such chemicals flow through pipelines needs to be precise. Any surge in pressure may cause ruptures and put workers and other people at risk. The valves used to control the chemicals through the pipeline will need to ensure complete shutoff when it needs to and precise pressure is maintained when it is open. Hospitals, dairies, and pharmaceutical manufacturers are a few of the many industrial processes where sterilizing equipment are mandated, even legislated for. Sterilizers need fail-safe valves to prevent bacterial contamination, which will render the produced products unsafe for human use or consumption. The valves used must ensure enough sterilizing fluid is discharged at the right pressure. There are a lot other industrial applications for angle body valves. Some of these are industrial launderers, refrigeration and cooling heat exchangers, air dryers, mines, cement and concrete systems, and pulp and paper manufacturing. These valves are designed to stay closed, until fluid pressure forces them to open. They are used to block flow and may only open after the controlled fluid reaches a certain pressure threshold, beyond which continued operation may become unsafe. Normally closed valves direct fluids over the valve seat, which helps to maintain a tight seal. For this, the actuator spring is set in relaxed mode. It will compress, and lift the valve seat, as the fluid pressure increases. As the fluid pressure comes back to normal, the spring will relax and force the valve seat to close again..
● Protecting critical machinery from damage in the event of ruptures. The valves in this range have bodies and actuators made in stainless steel, which is noted for greater strength and superior friction resistance properties. 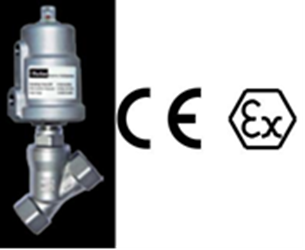 The valves are equipped with an optical position indicator that shows if a valve is in closed or open mode. The opposite of normally closed valves, normally open valves are designed to remain open as long fluid flow is maintained at a certain pressure. They thus have a similarly important safety function as normally closed valves. 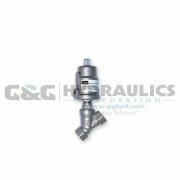 Normally open valves have a reverse action to that of the normally closed valves. To remain open, flow is channeled from the opposite direction - from under the valve seat. When used with a pilot valve, all excess pressure is directed over the valve into the actuator cavity where it will force the piston down to partially close the valve and regulate the fluid’s flow. ● Protect critical machinery from damage in the event of the ruptures. The valves in this range have stainless steel bodies for shatterproof strength as well as stainless steel actuators for greater friction resistance and maximum durability. They are fitted with an optical position indicator, which indicate if a valve is in closed or open mode for easier pipeline monitoring. Normally closed valves are susceptible to water hammer damage. Water hammer, or surge, is common with check valves and happens when there is a sudden surge of fluid pressure. Usually, pressure surges happen when a pump suddenly stops and starts, or when the valve closes suddenly. This will force an abrupt change in the rate of flow. Water hammer can cause valve issues like broken seals, blown diaphragms, and damage to meters, gaskets, and gauges as well as other serious effects on the pumping system. It is marked by a banging or thumping sound in the pipe. This series is designed with special anti-water hammer functionality. As opposed to normally closed valves whose flow direction is over the valve seat, with the anti-hammer functionality, flow is under the seat. The valve will still open as designed, to control fluid flow in the event of a pressure surge. But here the advantage is the seat has less distance to travel and close before flow is reversed when the pump is suddenly stopped with the valve is still open. Without the anti-water hammer feature, the abrupt pressure reduction will cause reverse flow, which forces the seat to slam back into the closed position, causing damage to the valve and pumping system. As with standard normally closed valves, these valves also have stainless steel bodies for shatterproof strength as well as stainless steel actuators for greater friction resistance. They are fitted with an optical position indicator, which shows if a valve is in closed or open mode. This valve has the same basic design as the normally closed valve. They however benefit from a more compact design. With just as much capacity as normally closed valve with anti-water hammer functionality and same under-the-seat flow, these valves’ compact size come with advantages. The valves smaller build makes them a good fit for applications where space is limited. They still produce a firmer seal as well as the other advantages of normally closed angle body valves. The firmer seal is a result of the extra pressure from fluid sitting on the seat, which makes the actuator spring’s job a lot easier. The tight seal helps minimize fluid bypass but the valve will still yield when fluid pressure exceeds the desired, safe level. The valves have stainless steel bodies for shatterproof strength as well as stainless steel actuators for greater friction resistance. They are also fitted with an optical position indicator, which shows if a valve is in closed or open mode. These valves have a smaller, more compact build, which makes them suitable for use where space is at a premium. They are good where a larger valve will be difficult to install, replace, or repair in the event of a breakdown. Unlike normally closed angle body valves for which flow direction is over the seat, these valves have fluids flowing from under the seat. The flow direction is from left to right. As with other valves in the series, these valves have stainless steel bodies for shatterproof strength as well as stainless steel actuators for greater friction resistance and maximum durability. They are fitted with an optical position indicator, which indicates if a valve is in closed or open mode. Banjo pilot valves use electromechanical power to compress the actuator on the angle body valve that actually regulates fluid flowing through a pipeline. The valves can be used to control much larger valves. The angle body valve itself is normally closed, which means the solenoid valve’s function is to keep the main actuator compressed so the valve may remain closed, until a pressure threshold is breached. The pilot valve comprises a solenoid, which converts electrical energy into a mechanical force that powers the actuator on the angle body valve. The electrical power required for the solenoid valve depends on the pressure the fluid is flowing at and the size of the pipe in which it flows. A solenoid actuated angle body valve is termed normally closed if it is closed when the solenoid pilot valve itself is not energized. These valves also feature stainless steel bodies for shatterproof strength as well as stainless steel actuators for greater friction resistance. They feature an optical position indicator, which shows if the valve is in open or closed position. 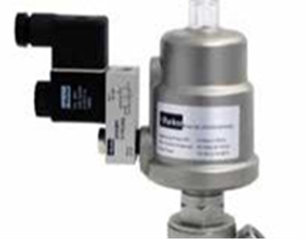 Three-way direct acting pilot control valves manipulates pressure from fluids from flowing in the same larger pneumatically powered valve it is deployed to control. Port No. 1 is connected to the larger valve’s inlet port to draw pressure from the fluid’s flow and diverts it, through Port No. 2, into the larger control valve’s actuating cylinder. That pressure is then used to actuate the larger valve. In a sense, the larger control valve powers itself, with help from the direct-acting pilot valve. The pilot valve’s third port functions as an exhaust pipe that channels excess pressure out into the atmosphere. Actuator is the component of the valve that regulates the flow of fluids passing through the valve. It uses hydraulic, pneumatic, or electric energy to function. De-energize is to turn off the pneumatic, hydraulic, or electrical energy that powers the process valve. Diaphragm is a mechanical device that sits on top of the valve to pump the air - pneumatic energy - that powers the actuator. Media is the steam, water, air, or gas flowing within a pipeline, whose pressure a valve is deployed to regulate. Normally Closed Valves are safety valves designed to stay closed and block flow. They only open after pipe pressure exceeds a set threshold to prevent ruptures. Normally Open Valves are valves designed to stay open and maintain fluid flow at a certain pressure. They will gradually close when flow increases beyond a set measure. These valves are excellent at keeping flow pressure in check. Packing ring is a ring, usually of rubberized material, that is inserted into pressurized connections to produce a tight seal. Polytetrafluoroethylene (PTFE) - is a hydrophobic and friction resistant material used to protect metal surfaces and to protect the fluids being transported in the line from bacterial contamination. Pilot Control Valves are small valves that are fitted to larger valves to manipulate the pressure from the fluid flowing into the larger valve to provide the actuating pressure that powers the same larger valve. The valves are pneumatically powered, but there are others that are electromechanically or hydraulically powered. Solenoid Valve is a small pilot valve that uses electrical energy to generate the pressure that actuates a control valve. Valve piston is the part of the valve that forces the linear air compression within the valve stem to regulate the flow of fluids through the valve. Water Hammer is a valve function problem that happens when there is a sudden reverse flow within a pipe. This is marked by thumping sounds within the pipe and is a result of using pipes that are too small, abruptly shutting the pump, or closing the valve too fast. PA65S1NTS100A Parker PA Angle Valves, 2-1/2" 304 Stainless Steel Bodies with Aluminum Actuators..
PA65S1NTR100S Parker PA Angle Valves, 2-1/2" 316L Stainless Steel Bodies with 304 Stainless Ste..
PA50SAN9S100A Parker PA Angle Valves 2" 304 Stainless Steel Bodies with Aluminum Actuators, 2 W..
PA50SAN9R100S Parker PA Angle Valves 2" 316L Stainless Steel Bodies with 304 Stainless Steel Ac..
PA50S3N9S080A Parker PA Angle Valves 2" 304 Stainless Steel Bodies with Aluminum Actuators, 2 W..
PA50S3N9R080S Parker PA Angle Valves 2" 316L Stainless Steel Bodies with 304 Stainless Steel Ac..
PA50S1N9S100A Parker PA Angle Valves, 2" 304 Stainless Steel Bodies with Aluminum Actuators, 2 ..
PA50S1N9S080A Parker PA Angle Valves, 2" 304 Stainless Steel Bodies with Aluminum Actuators, 2 ..
PA50S1N9S063A Parker PA Angle Valves, 2" 304 Stainless Steel Bodies with Aluminum Actuators, 2 ..
PA50S1N9R100S Parker PA Angle Valves, 2" 316L Stainless Steel Bodies with 304 Stainless Steel A..
PA50S1N9R080S Parker PA Angle Valves, 2" 316L Stainless Steel Bodies with 304 Stainless Steel A..
PA50S1N9R063S Parker PA Angle Valves, 2" 316L Stainless Steel Bodies with 304 Stainless Steel A..
PA40SAN8S100A Parker PA Angle Valves 1-1/2" 304 Stainless Steel Bodies with Aluminum Actuators,..
PA40SAN8S080A Parker PA Angle Valves 1-1/2" 304 Stainless Steel Bodies with Aluminum Actuators,..
PA40SAN8R100S Parker PA Angle Valves 1-1/2" 316L Stainless Steel Bodies with 304 Stainless Stee..
PA40SAN8R080S Parker PA Angle Valves 1-1/2" 316L Stainless Steel Bodies with 304 Stainless Stee..
PA40S3N8S080A Parker PA Angle Valves 1-1/2" 304 Stainless Steel Bodies with Aluminum Actuators,..
PA40S3N8R080S Parker PA Angle Valves 1-1/2" 316L Stainless Steel Bodies with 304 Stainless Stee..
PA40S1N8S063A Parker PA Angle Valves, 1-1/2" 304 Stainless Steel Bodies with Aluminum Actuators..
PA40S1N8R063S Parker PA Angle Valves, 1-1/2" 316L Stainless Steel Bodies with 304 Stainless Ste..
PA32SAN7S080A Parker PA Angle Valves 1-1/4" 304 Stainless Steel Bodies with Aluminum Actuators,..
PA32SAN7R080S Parker PA Angle Valves 1-1/4" 316L Stainless Steel Bodies with 304 Stainless Stee..
PA32S3N7S080A Parker PA Angle Valves 1-1/4" 304 Stainless Steel Bodies with Aluminum Actuators,..
PA32S3N7R080S Parker PA Angle Valves 1-1/4" 316L Stainless Steel Bodies with 304 Stainless Stee..
PA32S1N7S063A Parker PA Angle Valves, 1-1/4" 304 Stainless Steel Bodies with Aluminum Actuators..
PA32S1N7R063S Parker PA Angle Valves, 1-1/4" 316L Stainless Steel Bodies with 304 Stainless Ste..
PA25SAN6S063A Parker PA Angle Valves 1" 304 Stainless Steel Bodies with Aluminum Actuators, 2 ..
PA25SAN6R063S Parker PA Angle Valves 1" 316L Stainless Steel Bodies with 304 Stainless Steel Ac..
PA25S3N6S063A Parker PA Angle Valves 1" 304 Stainless Steel Bodies with Aluminum Actuators, 2 W..
PA25S3N6R063S Parker PA Angle Valves 1" 316L Stainless Steel Bodies with 304 Stainless Steel Ac..
PA25S1N6S063A Parker PA Angle Valves, 1" 304 Stainless Steel Bodies with Aluminum Actuators, 2 ..
PA25S1N6S050A Parker PA Angle Valves, 1" 304 Stainless Steel Bodies with Aluminum Actuators, 2 ..
PA25S1N6R063S Parker PA Angle Valves, 1" 316L Stainless Steel Bodies with 304 Stainless Steel A..
PA25S1N6R050S Parker PA Angle Valves, 1" 316L Stainless Steel Bodies with 304 Stainless Steel A..
PA20SAN5S050A Parker PA Angle Valves 3/4" 304 Stainless Steel Bodies with Aluminum Actuators, 2..
PA20SAN5R050S Parker PA Angle Valves 3/4"316L Stainless Steel Bodies with 304 Stainless Steel A..
PA20S3N5S050A Parker PA Angle Valves 3/4" 304 Stainless Steel Bodies with Aluminum Actuators, 2..
PA20S3N5R050S Parker PA Angle Valves 3/4" 316L Stainless Steel Bodies with 304 Stainless Steel ..
PA20S1N5S050A Parker PA Angle Valves, 3/4" 304 Stainless Steel Bodies with Aluminum Actuators, ..
PA20S1N5R050S Parker PA Angle Valves, 3/4" 316L Stainless Steel Bodies with 304 Stainless Steel..
PA20C2N5R032S Parker PA Angle Valves 3/4" 304 Stainless Steel Actuators with 316L Stainless Ste..
PA20C1N5R032S Parker PA Angle Valves 3/4" 316L Stainless Steel Bodies with 304 Stainless Steel ..
PA15SAN4S050A Parker PA Angle Valves 1/2" 304 Stainless Steel Bodies with Aluminum Actuators, 2..
PA15SAN4R050S Parker PA Angle Valves 1/2" 316L Stainless Steel Bodies with 304 Stainless Steel ..
PA15S3N4S050A Parker PA Angle Valves 1/2" 304 Stainless Steel Bodies with Aluminum Actuators, 2..
PA15S3N4R050S Parker PA Angle Valves 1/2" 316L Stainless Steel Bodies with 304 Stainless Steel ..
PA15S1N4S050A Parker PA Angle Valves 1/2" 304 Stainless Steel Bodies with Aluminum Actuators, 2..
PA15S1N4R050S Parker PA Angle Valves, 1/2" 316L Stainless Steel Bodies with 304 Stainless Steel..
PA15S1N4R040S Parker PA Angle Valves, 1/2" 316L Stainless Steel Bodies with 304 Stainless Steel..
PA15C2N4R032S Parker PA Angle Valves 1/2" 304 Stainless Steel Actuators with 316L Stainless Ste..
PA15C1N4R032S Parker PA Angle Valves 1/2" 316L Stainless Steel Bodies with 304 Stainless Steel ..
PA10SAN3S050A Parker PA Angle Valves 3/8" 304 Stainless Steel Bodies with Aluminum Actuators, ..
PA10SAN3R050S Parker PA Angle Valves 3/8" 316L Stainless Steel Bodies with 304 Stainless Steel ..
PA10S3N3S050A Parker PA Angle Valves 3/8" 304 Stainless Steel Bodies with Aluminum Actuators, 2..
PA10S3N3R050S Parker PA Angle Valves 3/8" 316L Stainless Steel Bodies with 304 Stainless Steel ..
PA10S1N3S050A - Parker PA Angle Valves, 3/8" 304 Stainless Steel Bodies with Aluminum Actuators..
PA10S1N3R050S Parker PA Angle Valves, 3/8" 316L Stainless Steel Bodies with 304 Stainless Steel..
PA10S1N3R040S Parker PA Angle Valves, 3/8" 316L Stainless Steel Bodies with 304 Stainless Steel..
PA10C2N3R032S Parker PA Angle Valves 3/4" 304 Stainless Steel Actuators with 316L Stainless St..
PA10C1N3R032S Parker PA Angle Valves 3/8" 316L Stainless Steel Bodies with 304 Stainless Steel ..